Ian McGuire’s The North Water is as transfixing and weighty as a looming iceberg; you know carnage is coming but you can’t look away. Longlisted for the 2016 Man Booker Prize,* The North Water is filthy with conflict; there’s man vs. man, man vs. nature, and man vs. beast,** but in this excellent novel, it is often difficult to tell the men from the beasts. McGuire uses language to paint vivid watercolours inside your brain. So much so — you hear the wind scream, you feel the frigid sea spray sting your face, and you smell the blood. The prose is as rich and as satisfying as a bowl of homemade soup on a cold wet day. Like all the best books, there are sentences you can savour, reading them again and again and yet there is not a wasted word. The narrative reads like riding a runaway horse. You’d better hang on. I read this book twice back to back. You should too. It’s worth your time. * Sadly, The North Water did not make the 2016 Man Booker Prize shortlist. A great shame. 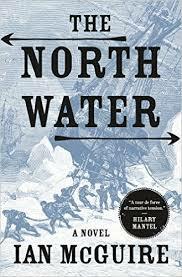 ** Not part of the conflict canon, but The North Water makes a case for man vs. beast as part of an expanded list. The vitality of your review convinced me to get this from the library. I rarely read fiction, but this sounds like an invigorating change of pace. Thanks for the recommendation! Ah wonderful! Beware — there are some chilling scenes in this book. You make an enticing case for reading this book. The setting seems stark, interesting and vital to the book. I love novels where characters evolve and devolve. Is it reminiscent of Lord of the Flies but it an adult setting? Thank you, Barb! Yes, the setting is bitterly cold and that figures heavily into the characters’ actions. Wow, I think I should read this!